Sweetly scented, violet-blue, edible flowers from February to March and heart-shaped, bright green leaves. 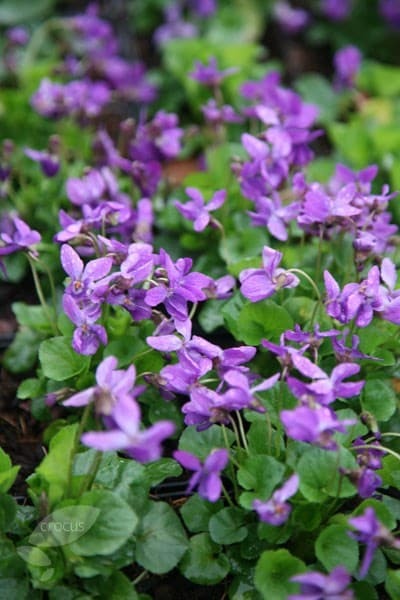 Sweet violets are perfect for naturalising in a shady woodland garden or shrub border in moist, well-drained, humus-rich soil. Much loved by Victorian dandies, the exquisitely scented blooms make delightful cut-flower posies, are excellent when chrystallised, add an exotic-looking touch to the salad bowl and can be used to adorn cakes, desserts and iced drinks. Garden care: Keep the seeds chilled until they can be sown. Early sowings can be done in a cold frame, into trays of good seed compost and gradually hardened off before planting out. Alternatively sow directly into a well-prepared seed bed. Gently thin the seedlings out to 15cm apart when they are large enough to handle.